The best-selling book of all time is getting an update to keep pace with modern language usage while eliminating some patriarchal references. Zondervan, an evangelical Christian publisher based in Grand Rapids, Mich., has released a new translation of the New International Version -- its first since 1984. The goal is to make the the text more readable for the general public in view of connotative changes in the English language. 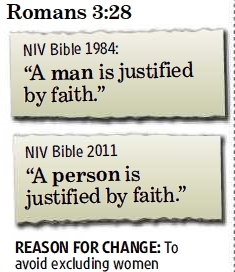 The graphic on the right, courtesy of the Detroit Free Press, depicts one such revision at Romans 3:28 where the word "man" is replaced with "person." Is this a victory for post modern feminists, whose perpetual goal has been to deconstruct language in order to root out gender and sexist stereotypes? Maybe. 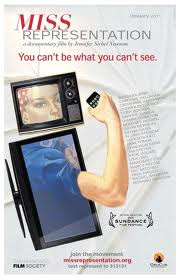 Such revisions of have always been controversial, especially when it comes to issues of gender. The Committee on Bible Translation was criticized by conservative Christians in 2005 who felt that a its Bible translation titled "Today's New International Version, " or TNIV, went too far in its use of gender neutral language. According to the Detroit Free Press, the Council on Biblical Manhood and Womanhood, a conservative Christian group based in Kentucky that favors traditional male-female roles, said there were more than 3,600 problems related to use of gender in the TNIV. 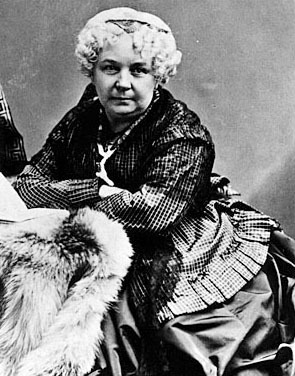 But, the gender controversy reaches farther back to the days of first wave feminism when Elizabeth Cady Stanton -- one of the original suffragettes -- didn't like what she read in a revised translation by the Church of England in 1888 -- a revision 277 years in the making. Stanton was upset that, among other things, the church did not consult biblical scholar Julia Smith in the revision process. So, in 1895, Stanton set up her own "revising committee" to evaluate what Sacred-Texts.com calls, "the Judeo-Christian legacy and its impact on women through history." Her goal was to not only to "correct Biblical interpretation which they (the committee) believed was biased unfairly against women," according to About.com. The end result was "The Woman's Bible," a version that includes feminist commentary by Stanton throughout. Sacred-Texts.com says "While many of her views are still controversial, time and advances in womens' rights have lessened some of the shock value of this book." The Woman's Bible is considered a classic feminist text and is still in print today. Stanton did not go so far as to proclaim God was a woman -- and neither does the new NIV translation. The NIV translation committee says, “Nowhere in the updated NIV… is there even the remotest hint of any inclusive language for God." Yet, with this new translation, Stanton -- as well as today's postmodern feminists -- can claim a significant victory with the inclusion of gender-neutral language in a sacred text without changing the essential meaning. And it only took 116 years.